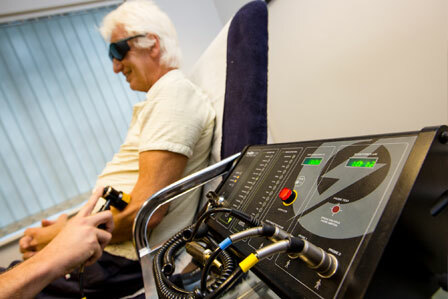 Our LASER system is used for a variety of ailments and injuries. Its benefits include instant pain relief and faster healing, all without being intrusive and completely pain free. The cells in our bodies react to light in different ways depending on the strength and wavelength. For instance in neonatal jaundice blue light is used for treatment, for Psoriasis UV light is used for treatment, everyday sunlight synthesises vitamin D and also changes our skin colour! In this treatment red and near infra-red light reduces oxidative stress and increases Adenosine triphosphate (ATP). This improves cell metabolism and reduces inflammation, resulting in pain relief and a faster recovery! The effects are photochemical, like photosynthesis in plants! These affects have been tested in over 400 clinical trials (RCT’s) and thousands of laboratory studies which are published in many leading journals including The Lancet and BMJ. Our Photobiomodulation LASER system stands out being the exact same system as the Olympic and top sports clubs use to get their athletes back quicker! It is the only PBM laser system with FDA, CE, TGA, Health Canada and NATO clearance for proven beneficial affects on tissue repair and pain reduction. We have over 6 years of positive results from this treatment ranging from neck pain to sciatica, muscle strains to bone fracture repair. As the first private clinic in the South West to offer this treatment, our experience leads the field as PBM experts.